Offense is the key to a Player vs Player (PvP) game. Defense is important, don’t get me wrong, but you can have the best defenses in the game yet keep on losing because your offense is unable to get you over the goal line. Offensive Capabilities are just that - what your offense is capable of delivering. Each level of Builder Hall has certain troops and specific levels of those troops that dictate how powerful the offense can become. At BH1, you get only the Raged Barbarian and he’s not very strong; just enough to go through the tutorial and learn the basics of how to play the game. At BH2, you get the Sneaky Archer and you can start upgrading your troops to level 4. BH3 introduces the Boxer Giant, Beta Minion, and level 6 troops not to mention a third Army Camp. BH4 brings us the Bomber for ground attackers and the Baby Dragon for air attackers. We also get our fourth Army Camp. In short, your offensive capabilities have taken a significant leap forward over the course of the first four levels of the Builder Hall (just a week or two into the game). We first start really seeing effective, hybrid army compositions at BH4 - BArch, Bombarian, and Beta Drags in particular. BH5 brings us a new ground troop in the Cannon Cart, but it really isn’t very useful until later in the game. The most important contribution to offensive capabilities from BH5 are the troop upgrades. The Baby Dragon, at level 10, can now have 3 units per camp allowing us to carry 12 into battle. We get 5 extra Raged Barbarians per camp (for a total of 60); 2 more Sneaky Archers per camp (up to 32 altogether); 2 more Beta Minions per camp takes us up to 32 in a Mass Beta Minion attack; and even the Bomber moves to 4 per camp which helps with Bombarian. BH6 introduces the Night Witch and level 12 troops. Some troops get more units per camps, while others get much stronger (HP/DPS). Night Witches, once maxed, become a secondary troop to reckon with - the Mitch attack (Beta Minions and Night Witches), along with its cousin Baby Mitch (swap one camp Beta Minions with Baby Drags) are strong winners. Spam attacks - rapid deployment strategies involving just one troop - become more prevalent here because the troops are so much stronger. BH7 is the next big leap forward in offensive capabilities with the addition of the fifth Army Camp. Like BH4, this additional Army Camp is THE separating factor between BH7 and BH levels below it. We also get the Drop Ship and two new levels of troop, taking us to level 14. At this point, you can probably see the pattern and growth in our offensive capabilities. What does that mean to gameplay though? Well, the most obvious benefit to offense is when we make the troops stronger and add more units to the Army Camp. Although each BH level adds one or more new troops, their addition to the game does not always mean they’re very useful. For example, the Beta Minion comes to us at BH3 but it isn’t until he’s upgraded to level 8 at BH4 that he really becomes useful. The same can be said for other troops. 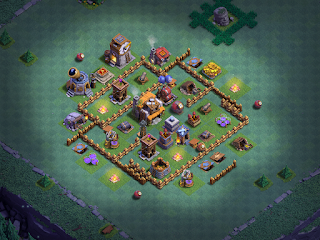 Likewise, later in the game, the addition of the Night Witch and the Drop Ship do not improve offensive capability until they’ve been sufficiently upgraded to have the strength and stamina to counter defensive capabilities common to those Builder Hall levels where they are introduced, and that isn’t going to be until later in the game. Each troop has a level where it becomes usable and a higher level where it really starts to come into its own. Of course, Raged Barbarians and Sneaky Archers are as effective as they can be for the first three Builder Hall levels. However, the Boxer Giant is not a very effective troop at all at BH3 because you can only put 2 in an Army Camp and when you only have 3 Army Camps, that’s a lot of space to give up. As I already mentioned, Beta Minions aren’t very useful at BH3 because they’re just too weak against defense. At BH4, we see the first real increase in camp size for these core units. Boxer Giants moves to 3 per camp, Beta Minions strengthen up a bit and move to 8 per camp. Of course, other troops have progressed as well (such as Raged Barbarians to 10 per camp at level 6). The increased number of units per camp, and the fourth Army Camp, present your first big bump to offensive capabilities at BH4 and their impact is pretty straightforward. This same concept carries forward to later Builder Hall levels where we see the same increases (such as the aforementioned BH7 and its fifth Army Camp). In addition to increasing power and numbers, these allow for more complex attacks; the hybrid army composition grows and strengthens as well. Mitch first becomes a strong contender at BH6 but, with the addition of a fifth army camp and level 14 troops, it becomes a solid powerhouse at early to mid BH7. By the time you hit the back leg of BH7, you’ll have Drop Ships; upgraded to level 10 or higher, they provide the same level of tanking services to air attacks that Boxer Giants give our ground troops. Carrying 6 Army Camps of Drop Ships into battle, with 2 camps of level 14 Beta Minions, provides LONGER tanking value and a bunch of skeletons to work on ground-based units before they can ever fire on your Battle Machine. This brings us to the Battle Machine. In an earlier article on my blog, I talked about when to upgrade the Battle Machine and why. The Battle Machine is a HUGE boon to your offensive capabilities at BH5 and he should be one of the very first things you get just as soon as you upgrade your storages. Even at level 1, he’s great for tanking and clean up. However, I also say he should be at the end of your BH5 upgrade list! Until he reaches level 5, he doesn’t offer much more over level 1 and even then, he just isn’t as important as your troop upgrades are for your BH5 game. At BH6 you get 5 more levels of Battle Machine and I don’t even upgrade him until BH7 when I get another 10 levels on top of that! Why? Because the levels may add more HP and DPS, but it’s not enough to really turn him into a major factor in offensive capabilities. The minor increases in HP and DPS are so small that you’ll only typically see the benefits in clutch wins. Is that helpful? Well…sure, it is. Should you base your offensive strategy around clutch wins…? Absolutely not. Now we come to the second pillar - your attacking skills. In the the companion video to this article, I run replays of offensive wins in the background while discussing this topic. They’re all three star, 100% wins and they showcase several different attack strategies across BH7. Although these are BH7 replays, the same applies to any level of the game. I'm a decent attacker, overall, and I frequently turn out high percentage 2-star wins and fairly regular 3-star wins (especially on my primary game). That's no accident - I run 50 attacks on any given day; during Battlefest, I was running 100 or more attacks each day. On top of that, I occasionally tack on 15-20 or more attacks while working on a new strategy or such. That's a LOT of practice. If you can’t attack, it doesn’t matter how strong your troops are, or how great your defenses, or what a whiz-bang base design you run…you won’t get a high enough percentage of destruction to win the match. True, having strong offensive capabilities will make a poor attacker appear stronger, but that will only get you just so far in the game. We hear all the time about how some attack or another is just OP (OverPowered) and can’t be beaten. Most players are focused solely on defending against the OP troop or attack strategy when they should also be focused on their abilities as an attacker! Take for example the current favored attack strategy - Bombarian. Right now, the Raged Barbarian is THE troop to have maxed at BH7. He’s a force and a half to reckon with, both on his own and when combined with other troops. Bombarian introduces the manic power and mass numbers of the Raged Barbarian to the ultimate pathing destructor, the Bomber. Between the two of them, no base can withstand the onslaught. This attack strategy commonly results in 65%, 2-star results or better against most base designs, even for mediocre players. If you can’t stop an OP attack with defense, there’s only one other way to win the match - with a superior attack. First and foremost, there’s your Offensive Capabilities - You’ve got to have solid troops to form a solid attack. We’ve already talked about this one in depth. The second is Versatility - Variety is the spice of life. There are a lot of different base designs and each level of defensive structure has something different to offer the overall defense. Whereas Mitch may work well on one base, another may call for Mass Beta Minions, while yet another may be best attacked with Minion Drops (Beta Minions/Drop Ships). The best attackers are versatile attackers that carry multiple attack strategies into battle with them. The Builder Base game offers us a unique feature - you can change your army after seeing your opponent’s base. You may not get long, but if you can do a quick analysis of the enemy base - looking at both design layout and levels of defenses - you’ll quickly start to recognize certain bases that work better for certain attack strategies. For example - open, box-style bases where you have walls around the outer perimeter and everything inside the outer walls, tend to favor ground assaults like Bombarian or GiBoCC (Boxer Giants/Bomber/Cannon Carts). Many such bases don’t even need the Bomber - you can often break into the base by just sending a Boxer Giant or Raged Barbarian to hammer at a wall piece that is outside the range of defensive buildings. Layouts with a lot of compartments will almost certainly guide you to an air attack; all those walls and compartments tend to slow down ground attacks, but air troops really don’t care about those silly, little walls. Most players rush their game early on. This gets you to higher levels and increased daily loot potentials, but it tends to sacrifice attack versatility along the way. This is why it’s important to have a plan and eventually upgrade multiple troops to max levels rather than just relying on the one troop. If you can set yourself up with 3 different attack strategies, you’ll be able to quickly and effectively rise through the trophy rankings and the game will just be more fun. The third aspect of attacking skills is probably the most obvious - your experience as an attacker. The attack strategies commonly used in this game aren’t difficult to use but they do require some measure of practice to become proficient. No one just starts using an attack and is suddenly knocking out 3-star wins. That’s just not how it works. Attacking skills is probably the most difficult thing to obtain in this game. You can buy a defense and an offense; you can use an Internet base; but you can’t buy attacking skills or the knowledge of how to use your offense. There’s only one way to get experience as an attacker - that’s to attack over and over and over, even when you’re not getting loot. The top players in the world have thousands more wins logged than those who are lower in the trophy rankings. That’s experience. These are the first two pillars of Clash - Offensive Capabilities and Attacking Skills. Together, they comprise overall offense. The Builder Base is an offense-heavy game. This is especially the case at BH7, the top level at the time of this article/video. Of course, offense is just one half of the game - defense is coming up in my next article and video. Be sure to watch for it!